NASA's baseline Space Station of 1970, which was to be operational at early as 1977, was a large earth orbiting laboratory having a crew of 12 and a minimum operational lifetime of 10 years with resupply flights every 90 days. Status: Study 1970. Gross mass: 180,000 kg (390,000 lb). Span: 10.00 m (32.00 ft). 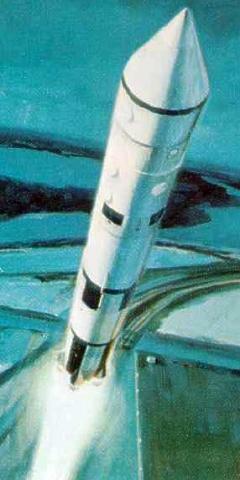 The station would be launched, unmanned, by an Saturn INT-21 (modified two-stage Saturn V). The station would be activated after completion of initial rendezvous and docking operations by the space shuttle. 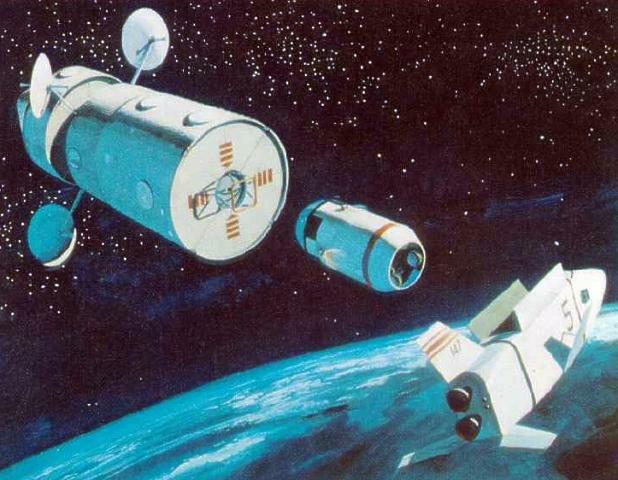 Space stations were part of a very ambitious post-Apollo space program proposed by the Space Task Group in 1969. In April of that year NASA solicited proposals for a Phase B Study of the Space Station from the aerospace industry. Two contracting teams, headed by McDonnell Douglas and North American Rockwell, were awarded $2.9-million Phase-B space station definition contracts in July 1969. Management of these teams was assigned to the Marshall Space Flight Center and the Manned Spacecraft Center respectively. Both contractors worked to a common work statement and configured core Space Station modules with many common factors. The Space Station core module was primarily designed for a zero-G environment. It was 10 m in diameter, 16.5 m long, and had five deck levels with a total volume of 930 cubic meters. 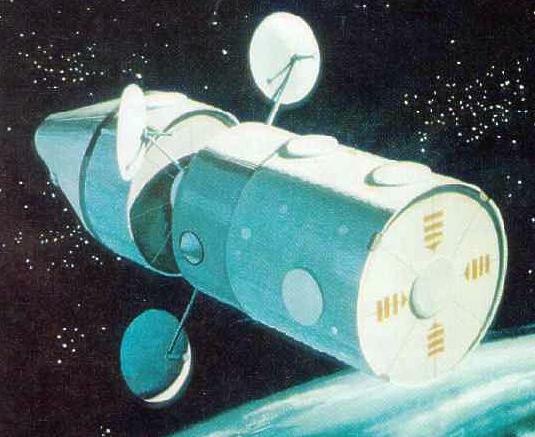 The station was to be protected from meteoroids with a fixed inner bumper and a deployable radiator and outer bumper. As launched, it was equipped for an initial artificial-g experiment using the spent S-II stage as a counterweight. 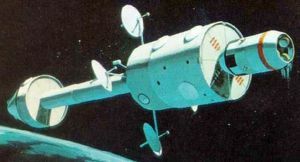 Cables and other equipment to deploy the S-II stage were located in an Artificial Gravity Module (AGM) located between the Space Station and the S-II stage. The artificial-g experiment could be repeated up to five times with a maximum duration each time of 30 days. After completion of the artificial-g experiments the associated hardware would be jettisoned. 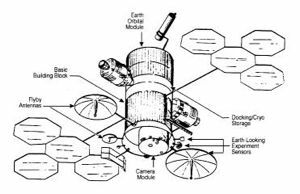 The station configuration thereafter provided positions for two shuttle docking ports and five experiment module docking ports. The baseline orbit was at a 55 degree inclination and 456 km altitude. The high inclination was selected primarily to provide maximum coverage for the earth-related experiments. The altitude was selected from considerations of earth coverage capability, orbit keeping requirements, the radiation environment, and launch rendezvous compatibility for subsequent logistic flights. The Space Station was to be launched by a Saturn INT-21 launch vehicle in a "Heads up" position to allow normal ground installation and checkout operations at KSC. The direct ascent mode (single continuous bun to orbit) would be employed. Since the launch azimuth was at the nominal range safety limit, S-II second stage yaw steering would be employed in a dog-leg maneuver to avoid Newfoundland during ascent. On the second day the shuttle would be launched with the first 12-man crew. Checkout and basic artificial g preparations would be the initial tasks. After 30 days of zero-g operations the station would be rotated at approximately 4 rpm. To acquire artificial gravity data. This data would be used for the design of the later 50 man rotating space base, and to investigate crew adaptation and performance in the artificial-G environment. For the period that the station was detached from the S-II during transposition. A separate Attitude Control System (ACS) contained in the AGM S-II artificial-g cable-reel section would be used to maintain attitude and stability until station redocking. For this short duration operation, the ACS would be battery powered and would use its own separate attitude reference sensors and electronics. Artificial-G operations were expected to be performed five times through the first 15 months (once every 3 months with each new crew) to obtain performance data on five separate crews, or a total of 60 people. After successful completion of the artificial-g operations, the S-II and artificial gravity hardware would be disposed on in the South-eastern Pacific. The Space Station would then operate at zero-g far the remaining eight years and nine months of its 10 year design life. The 12-man Space Station crew would be rotated nominally every 90 days via shuttle flights carrying station logistics and carry-on experimental equipment. With this frequency, a surplus cargo capacity would exist after the first two years, and the cycle could be relaxed to an average of 140 days, since 180 day consumable storage capability existed. The launch summary for the ten year mission consisted of two Saturn INT-21 launch vehicles, 42 shuttle launches, and 9 unmanned shuttle launches for delivery of experiment hardware (and Isotope /Brayton nuclear power system recovery, in the case of the McDonnell Douglas design). Subsystems and Maintenance Areas: Including the environmental control and life support subsystems, the electrical power control and distribution system, and control moment gyros for stabilization, and maintenance facilities. Deck 1: General Laboratory Areas: Including general purpose work areas and commonly used instrumentation and apparatus for small experiments. Deck 2: Command, Control and Data Management Centre: Including the controls and displays for station and co-orbiting module operations and for rendezvous and docking control of logistics vehicles and experiment modules, the computer systems, checkout and fault isolation, navigation, data management, and communications systems. Deck 3: Wardroom and Galley: Including facilities for dining, food preparation and storage, recreation, and exercise. Logistics and Spares Stowage Areas: Including pressurized stowage for spares and normally unpressurised volume for locating items such as high pressure tankage and toxic propellants. Artificial Gravity Provisions: Including structural attachments, booms, stabilization systems and spin-up and spin-down propulsion. Safety provisions included two completely independent pressurized volumes, airlocks, pressure and fire bulkheads, radiation protection from the arrangement of normal structure, consoles and stories, emergency monitoring, controls and supplies, pressure suits, micrometeoroid bumpers, fire suppression equipment, EVA equipment, repair tools, dual access routes to all decks, and to the station exterior. The North American Rockwell design used 930 square-m solar arrays to provide 25 kW electric power, attached at the end of a boom through a double gimbal system. This design was selected to move the arrays away from the radiators and docking ports, to minimize occultation of the array by the core and dock modules, and to decouple the station attitude orientation from the sun orientation required by the arrays. 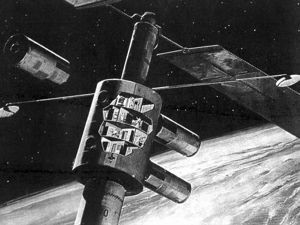 Communication antennas were also boom mounted to minimize the interference of the core module. A total of six universal docking ports were provided, four on the cylindrical surface and one on each end of the cylinder. The docking port on the conical end was dedicated to mounting of the solar arrays. Reaction control engines were mounted in clusters of three. Two clusters were located on the bulkhead at each end of the cylinder. The remaining surface area was occupied by radiators and two windows. A pressure floor and sealable hatch between the two middle decks was used to divide the module into two independent compartments in case of a pressure shell failure or a fire. An airlock connected the two compartments and additional airlocks were located in both ends. A McDonnell Douglas configuration was similar to the North American version except that it used an Isotope-Brayton electric power generation system. This made the deployment of large solar arrays unnecessary and the overall configuration more compact. Four antennas on booms were used to provide communications with the ground through relay satellites and to co-orbiting experiment modules as well as the shuttle vehicles. This configuration provided seven docking ports, five on the cylindrical section interdigitated to reduce interference problems and one on each end of the module. 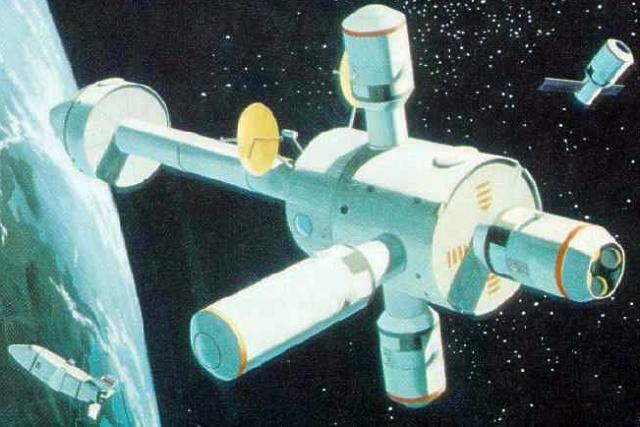 The McDonnell Douglas Space Station's power would be provided by an Isotope/Brayton system. Stabilization for operations was maintained by a four control moment gyro systems in conjunction with a biowaste resistojet system for desaturation and orbit keeping. A hydrazine monopropellant system was used for reaction control during scheduled disturbances and maneuvering. The communications system utilized four parabolic antennas (4.57 m diameter) in conjunction with three geosynchronous data relay satellites and two ground stations. Data management was based an a modular multi-processor computer featuring on-board checkout. Autonomous navigation, and standardized experiment interfaces. The Environmental Control and Life Support System consisted of a closed oxygen cycle utilizing a Sabatier reactor and a closed water cycle using air evaporation Logistic resupply for the Space Station was provided by the shuttle which could carry up to 18 metric tons of cargo in containers 4.57 m in diameter and up to 18 m long. The interior arrangement of the McDonnell Douglas design was markedly different from the North American Rockwell design. 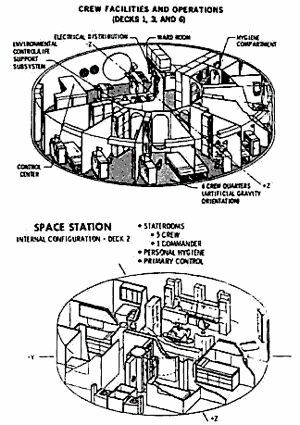 A large central tunnel ran the fell length of the module, providing a passage way between blocks, an airlock between pressure compartments, and an emergency refuge volume. The tunnel contained an emergency command center and waste management facilities. The station's interior was divided into two, common and symmetrical pressure volumes with toroidal bulkheads at both ends. An airlock in addition to the tunnel connected the compartments. The room partitions were generally radial rather than the orthogonal arrangement selected by North American. A primary concern of the Space Station design teams was to provide the crew with comfortable, safe and convenient accommodations in which to live for three to six month tours of duty. These accommodations included good food, adequate personal hygiene facilities, and quarters designed to meet the needs of the crew member for a private area in which to work and relax. The two study teams took different approaches to the design of the living volumes. McDonnell Douglas selected a design in which two identical decks were dedicated primarily to habitability usage. Each deck provided accommodations for one half the crew or six men. A food preparation area and dining area for six was provisioned on each deck. 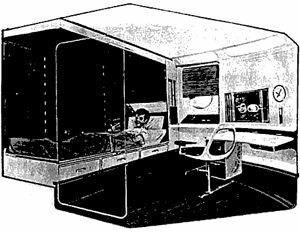 The individual crewmen had private compartments with a bed, desk, chair, and storage cabinets for personal property. North American Rockwell put common habitability facilities on each of three floors. A single food preparation and dining area served all 12 crewmen on deck 1. The medical facilities were also located on this deck. Decks 2 and 3 each provided private staterooms for six men and personal hygiene facilities. The station commander and the chief scientific investigator were provided with larger rooms to allow use as both a sleeping room and office. In both cases their rooms were adjacent to the appropriate control station for their activities. A great deal of thinking was done by specialists in design to find comfortable and pleasing arrangements, furnishings, color combinations, and good traffic and noise control. The laboratory facilities integral to the Space Station core module included equipment and areas for film processing, optical calibration, an electronics and electrical laboratory, and a mechanical shop. The area was very flexible and could be modified in orbit. 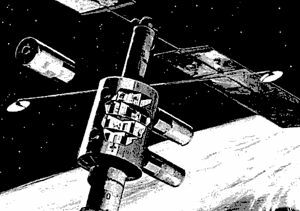 One of the major uninvestigated areas of manned space flight was (and still is) artificial gravity. 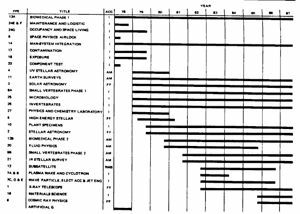 The long term physiological effects of zero gravity were not resolved at the time of the station studies (and were now known to be fairly serious). Ground tests could not resolve artificial-G questions such as spin tolerance and locomotion boundaries because of the 1 g field effects. 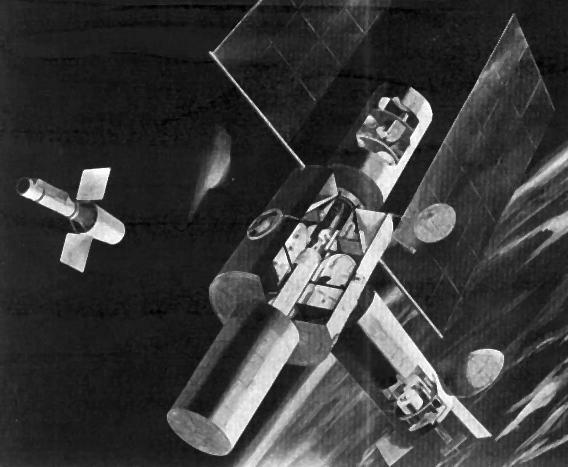 The primary motivation for a flight investigation of artificial gravity was then seen as related to the comfort and convenience it might provide. Activities such as food preparation, eating, personal hygiene, waste management, housekeeping and workbench operations were thought to be much easier in an artificial gravity field. Artificial gravity would also make it possible to use some available instrumentation or equipment not specifically designed for space. Thirty years later it was known that these perceived advantages of artificial gravity were trivial compared to the likely necessity of using it for long-duration missions to Mars. Both Phase B contractors investigated concepts for artificial gravity assessment, using the spent Saturn S-II stage as a counter-weight. The North American Rockwell design used a telescoping boom to change the radius while the McDonnell Douglas design used a system of cables. Gravity levels between lunar gravity and 0.7g would be available. 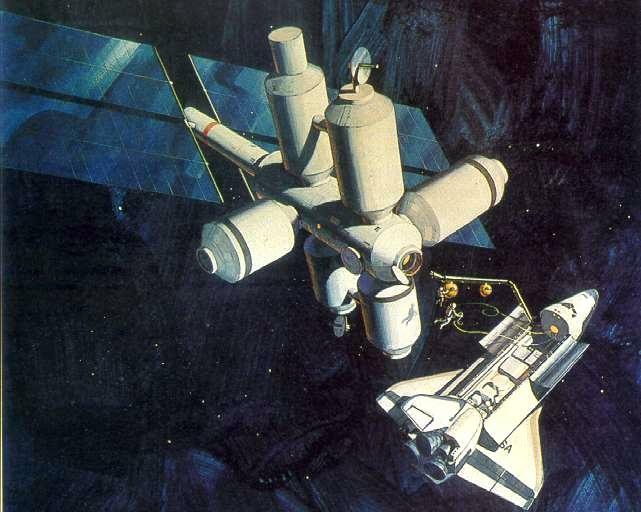 McDonnell Douglas also investigated a design with an additional two deck linking module as a counterweight instead of the S-II. The assessment was assumed to be a temporary condition of relatively short duration, possibly one to three one-month periods, during which other research operations could be suspended. Therefore, it might be appropriate to reduce the crew during these periods. As another consequence, the concepts did not include a non-rotating hub for zero gravity laboratories and Shuttle docking ports (as did the Space Base concepts). Both concepts shown provided a boom with access to the center of rotation where a small nonrotating room was located. The purpose of this feature was to permit tests simulating the conditions which would eventually be encountered on the Space Base where crewmen would live in a rotating arm for meals and rest. The ability of the astronauts and research crewmen to acclimate rapidly to the vestibular stimulation produced when transferring from nonrotating sections was a very important question. 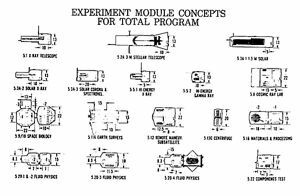 One of the most important features of the Space Station program was the use of so-called experiment modules. This concept provided a great deal of flexibility and was expected to decouple the experiment program from the station development program, simplifying overall management. The experiment modules would provide new laboratory and observatory facilities as they became available. The modules were delivered to the Station by the Shuttle and could be returned to the ground for major modification or for installation of a different laboratory. These equipment modules were the origin of the later Spacelab, Spacehab, and International Space Station modules. Two general types of experiment modules were to be used, attached and free flying. Attached modules stayed docked to the Station and drew on the basic utilities of the core module for electrical power, environmental control, stabilization, data processing, communications, and maintenance as well as for experiment set-up, monitoring and modification. Free flying modules would leave the Station after experiment set-up and fly in a loose formation with the Station at distances up to several hundred kilometers away. Therefore, the free fliers had to be much more self-contained with their own power, environmental control, stabilization, orbit keeping propulsion and other capabilities. Command and control, and data processing would be in the Station. To accomplish this, high data rate short range transmission capability was required on board the free flying module. 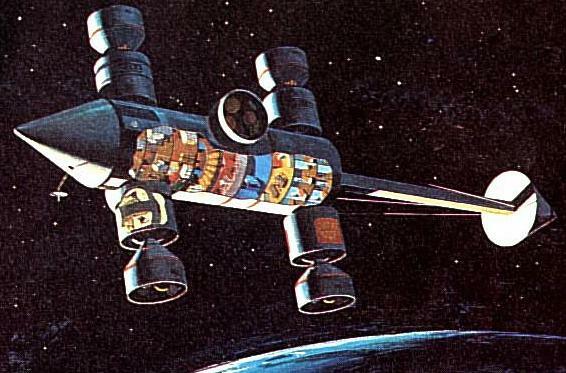 Servicing of the free fliers would be accomplished by returning the module to the Station, by the Shuttle en route to or returning from the Station, or by an orbit to orbit shuttle (or tug). Because of the importance of experiment modules to the overall Space Station program and to the potential user community, NASA devoted a substantial amount of effort in the Phase B studies to this subject. In addition, it contracted with General Dynamics Convair to conduct an independent study of the subject. This started somewhat earlier and important data to the program definition activities. In all three of the contract studies, one of the major tasks was to determine the best mode of experiment accommodation for such factors as the need for crewmen before, during, or immediately following tests, the allowable levels of disturbances from crew movement, the degree of biological isolation, the obscuring effects of escaping gas, etc. For maximum convenience and minimum cost, an experiment should be located integrally in the core Station module, or, if the experiment requires more or a different kind of space, in an attached module. Conversely, when extreme isolation, stabilization or clear viewing was required and crew access was needed only once a month or less, an experiment could be accommodated remotely in a free flying module. Astronomy module, developed by the Martin Marietta Corporation as a member of McDonnell Douglas's Phase B study team. A free-flying mode was selected for this module to prevent contamination of the surface of the three-meter diameter primary mirror. The module was stabilized to within 30 seconds of arc and an independent optics stabilization system provided the fine (one-tenth arc-second) stabilization required to utilize the resolution capability of the optics. This module would also fit within :he 4.6 m x 18 m dimensions of the Shuttle payload bay. Here the origins of the man-tended Hubble Space Telescope could be perceived. Space biology module, developed by General Dynamics/Convair, consisted of two main components: the Main Lab and the Centrifuge. The Centrifuge would be launched detached from the Main Lab, allowing it to be stowed in the Space Shuttle. This module would be operated attached to the Space Station, but separate atmospheres would be maintained to prevent, cross contamination. The origins of the later Spacelab could be perceived in this module. For most of the identified uses the station orbital characteristics were not critical. However, an important exception was Earth observations where high inclinations were required to get reasonable land mass coverage and relatively low altitudes were required to get the resolution and swath width combinations of interest with multi-spectral sensors. Space Station was expected to be useful in the development of Earth sensors and observation techniques. The selected inclination of 55 degrees was limited by range safety considerations. The circular orbit altitudes studied were in the range of 445 to 500 km. Orbit keeping propellant requirements increased rapidly at the lower bound and atmospheric protection from natural radiation fell off rapidly at higher altitudes . Space Stations could also be launched into other orbits. For example, without the weight of special equipment required for an experiment on artificial gravity, a two stage Saturn V could launch a monolithic version of Space Station into a polar orbit. A substantial dog leg to avoid range safety boundaries would be necessary in this case. For geosynchronous and lunar orbit missions, Space Station or its derivatives would require the use of an orbit to orbit Shuttle (with either chemical or nuclear propulsion) for the transfer from low Earth orbit. Station operations were highly integrated with and dependent on the Shuttle, for crew rotation, resupply of consumables and spares, delivery of research apparatus, experiment modules, and new subsystems and for return of film, magnetic tape, specimens, experiment modules due for refitting, contracted study to develop safety guidelines for Space Stations was complete in February. Most of the Space Station definition study activity was devoted to low Earth orbit missions with a 12 man crew. However four other classes of missions were investigated to understand the feasibility and impact of providing some growth capability in the original design. These required completion of development of the Nerva nuclear thermal upper stage. 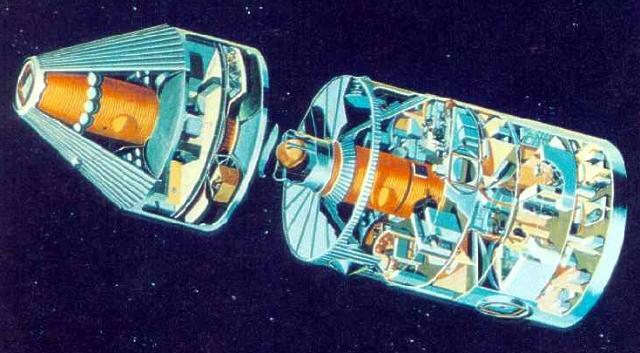 Single Saturn-launched NERVA stages could take Space Stations into geosynchronous orbit or lunar orbit. Clusters of NERVA stages would allow the Space Station to be used as a Planetary Mission Module on manned Mars flights. These missions would impose a requirement for additional shielding of the station to protect against solar flares. 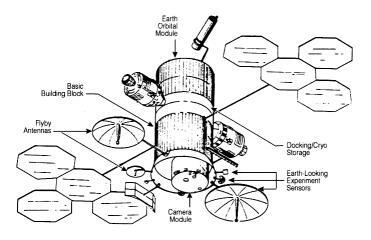 A lunar orbit Station would require a propellant tank farm to service tug operations to the lunar surface. Crew Size: 12. Habitable Volume: 930.00 m3. Electric System: 25.00 average kW. Family: Space station, Space station orbit, USA - Space Stations. People: McDonnell. Country: USA. Launch Vehicles: Saturn V, Saturn INT-21. Agency: NASA, North American. Bibliography: 481.